“UFC 148: Silva vs. Sonnen II” took place Saturday inside MGM Grand Garden Arena in Las Vegas, Nevada. 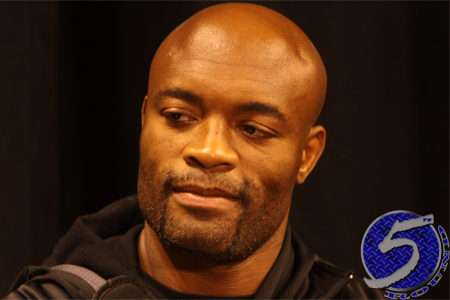 While Chael Sonnen may have believed he beat middleweight champ Anderson Silva (Pictured) in their initial tango, “The Spider” left no doubt as to who was the division’s king in their rematch. Although, Silva once again had to rally to finish off his archenemy. Freshly-dubbed UFC Hall of Famer Tito Ortiz ended his decorated mixed martial art career with a loss to Forrest Griffin in the show’s co-featured contest. Although the UFC promoted this card to no end, eight of the 11 fights in the lineup went the distance. Several of the scraps were bombarded with boos from the fans inside the venue. According to UFC president Dana White, 15,016 fans packed the arena, garnering a live gate of $7 million. That gate set an American record for the organization. Sonnen admitted the better man won. White was upset with Griffin for prematurely bolting to the locker room, and taking the mic from Joe Rogan to ruin Ortiz’s farewell speech. Per White, ‘Silva vs. Sonnen I’ sold the rematch, not Sonnen saying crazy things. White claims the UFC will be taking its talents to Russia soon. White doesn’t believe Silva’s knee on a grounded Sonnen was illegal, Sonnen wasn’t complaining about it, either. White was disappointed they didn’t give Mendes a better opponent. He stated McKenzie was out of his league. White said Silva vs. Jon Jones ain’t happening. Le wants to take some time off. White interrupts and says Le will get back in the gym and prepare for China card. Silva is asked who his next opponent should be. He says his clone. Sonnen doesn’t need time off. He wants to get back at it.